1. We would be the most organized world ever. That oldest child of mine has been alphabetizing the sizable video collection for eons….voluntarily. The middle child would know the value of a color-coded planning system. The youngest would make it much more creative and fun (much to the annoyance of his brother and sister). 2. We would be a compassionate world, where the most desperate would know they have a friend who will help them overcome their obstacles. The middle child has always seen every person as a valued friend or future friend. Even my strict oldest seems to find time for the down and out. The youngest, because he, himself, sometimes feels left out by society would be the first to volunteer for friendship duties. 3. We’d take risks, even when it wasn’t wise. The youngest defies logic in just about every way and yet, good things usually result. Maybe not immediately, but eventually. The other two simply hide their inner daredevil. At least it wouldn’t be boring. 4. Everyone would be expected to do their best. Slackers wouldn’t be tolerated. This might mean my youngest would have to get on board with this concept, but his siblings would overrule any attempt at slack-hood on his part, so he’d eventually cave. 5. We would tolerate differences. All of my kids seem to understand that others have different reasons for doing things the way they do. As long as they didn’t slack and didn’t impede someone else’s progress, the world would allow them to be who they are. 6. It would be a very verbose world. None of my kids are shrinking violets and if you aspire to violet-hood, they’re going to convince you that you just haven’t ventured from your shy closet much and need to be appreciated for the reserve you show the rest of the world. 8. Tardiness wouldn’t be an excuse. The middle child has pretty much always been a morning person, but the other 2 have always been comatose when asleep. Finding alarm clocks that actually wake the dead has been turned into an art form. But either way they all seem to get to work on time and expect that of everyone else. To not be there on time is considered rude. 9. There would be no war…at least for long. The oldest would expect 2 warring parties to settle their differences without him. If the differences continued, he would step in and people wouldn’t like how he settled it! But it would be settled…for good. The middle child would be more diplomatic about this sort of behavior. The last one would simply ignore that there even is a war until the war stopped due to a lack of funding. Which brings me to # 10. 10. The world would still have a huge debt problem. Why? Because even though the oldest and middle child have definitely embraced the notion of financial restraint, the youngest doesn’t even know how to check his bank balance online. So, I’m afraid the youngest would definitely outspend the other two in about 9 nanoseconds. 11. When there’s a problem, the oldest would boss everyone around until everyone was sick of his overzealous tendencies. The middle one would simply go hide and not even confide in anyone that there is an actual problem. (She knows it would be pointless to discuss it anyway.) The youngest would argue that the problem can be handled deftly by himself without help and eventually the problem would be handled quickly by Child # 2 and loudly by Child # 1 because they’d be afraid of the youngest’s a little too creative solution. 12. Fairness might die. Why? Well, the oldest already thinks that fairness did die and the middle child, as the only girl offspring, has always thought her life was totally unfair to begin with (and she’s right.). The youngest thinks that fairness is any time he totally gets his way. Eventually, the concept would have to be thrown out. 13. The status quo would be modified. The oldest would want the status quo enforced tooth and nail (and just where did that expression come from???). The middle child would point out, diplomatically, that the status quo isn’t exactly working anymore. The third would be fine with revising the status quo as long as it didn’t affect him directly. Even if it did affect him, the older two would withdraw all financial support until he gained some respect for a modified status quo. 14. There would be laughter. The eldest would create rules, where one was silly. The middle child would point out that all the rules are silly and why. The youngest would do a crazy dance illustrating how each rule is silly. Press conferences would be entertaining. Perfect society? Nope. But a better one? Yep, probably. Have at it, my 3! This entry was posted on Wednesday, August 13th, 2014 at 10:50 am and is filed under Fun Stuff. You can follow any responses to this entry through the RSS 2.0 feed. I really enjoyed that. Pretty much dead on. 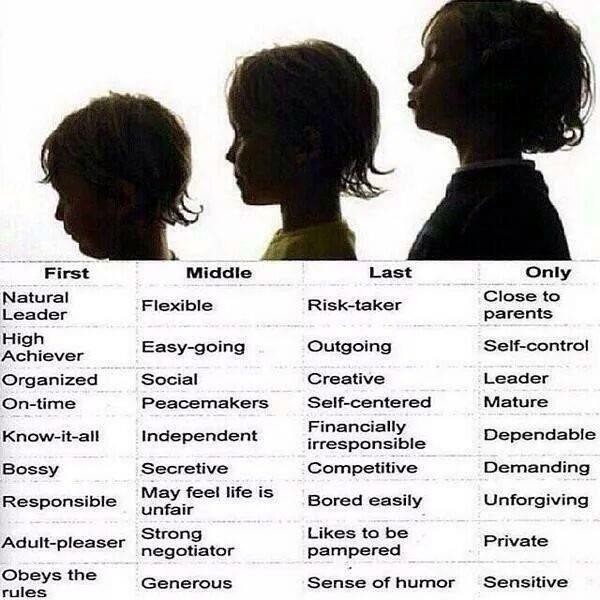 I think because I am the only girl some of my tendencies were straddling the middle and oldest child categories. Loved it! I think this is dead on. I think I fit all of them minus the only child and I think it’s due to me being my mothers first born but my fathers middle child and last daughter. I have grown out of that financially irresponsible part though. My brother is the last child and he displays everything that is on this chart. My husband is an only child and I can guarantee you that this is him. If my children were to be in charge then we better duck for cover cause my second child suffers from middle child and last child syndrome. she is a real wild card that we have to keep on a short leash on. My third and my last children are very creative and they tend to lead with their brains and guts. Mt first child would bring much compassion to the world. And she is also the one that can really keep the second and third child in line. She is a take charge person but in a nice way. She relates to people and does not mind getting on their level but do not be fooled by her kindness. As easy as she gives it she can turn the other cheek and sting you.